Newspapers, magazines, and TV commercials sling hundreds of slogans at us every day. In a world battered with messaging, many dismiss even the important issues, like Christianity, as merely more noisy chatter. 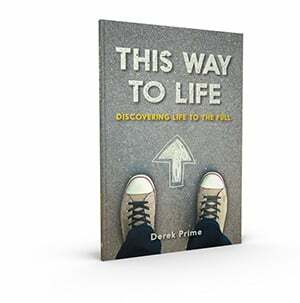 In his book, This Way to Life, Derek Prime cuts to the chase and shows those too busy to explore the facts that, when it comes to Christianity, the issues are far too great to discard. At rock bottom, Christianity offers life; both eternal life, and a life more fulfilling while we're on this earth. For those who haven’t taken time to explore the facts of what Christ offers, this concise handbook presents the fundamental truth of who God is, why He created us, and why knowing Him matters. Share the Christian faith with a friend or colleague by passing on this short but valuable book that points the way to life in Christ! If you're a Truthpartner, call Customer Service at 1.888.588.7884 or email Truth For Life at truthpartners@truthforlife.org to request this monthly resource.